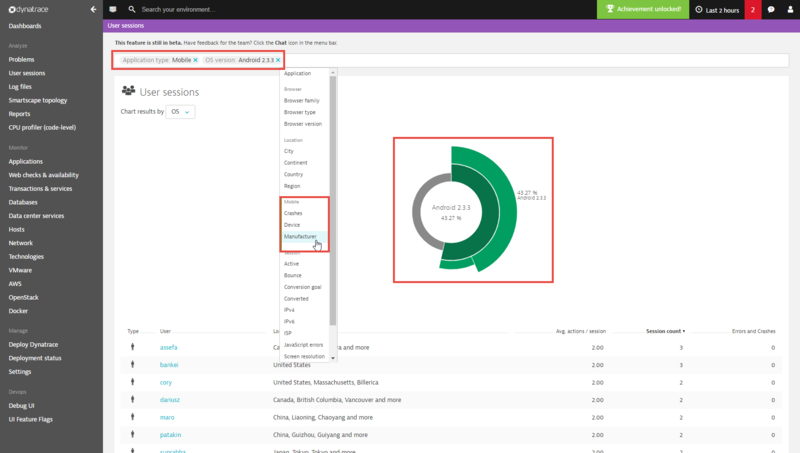 The latest Dynatrace release introduces mobile user session analysis. This enables you to seamlessly analyze each of your mobile user’s journeys through your applications. 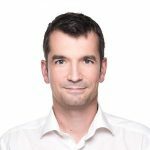 Within today’s digital consumer environments, having a mobile-first strategy for the marketing of your applications is imperative for business success. 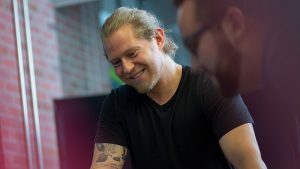 No matter if your users visit your web offerings via smartphone or tablet in a mobile browser or a downloadable native mobile app, your business success depends on high-performance mobile user experience. Billions of consumers worldwide use mobile devices exclusively for basic services such online banking, insurance purchasing, listening to music, hailing a ride, shopping, and of course communication with friends and family. 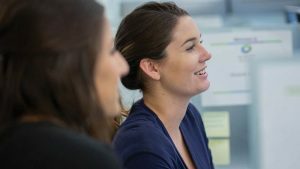 This is why Dynatrace is dedicated to a mobile-first monitoring strategy that offers a wide spectrum of technology insights into mobile user experience. 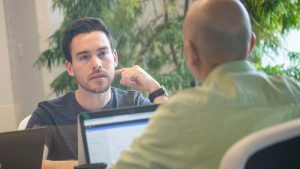 Dynatrace user session analysis enables you to track each of your mobile customer’s journeys through all your product channels, including desktop web, mobile web, and native mobile apps. such as Web site, mobile Web as well as mobile application. 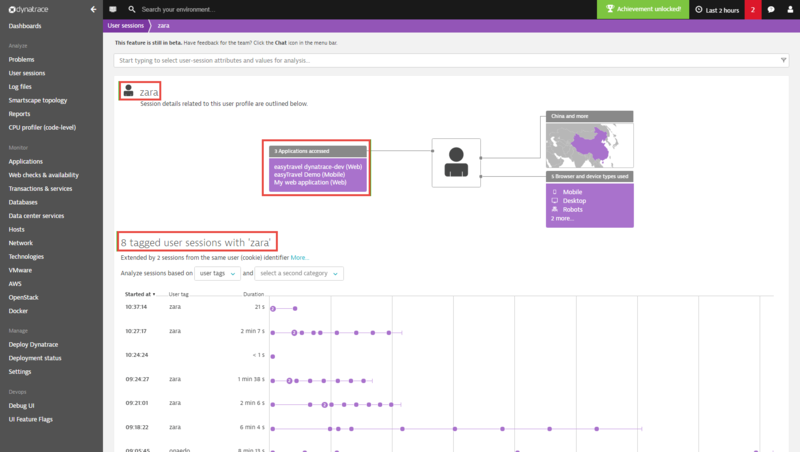 Without applying manual filtering, user session analysis shows all of your applications’ real user sessions that are monitored by Dynatrace in your environment. To focus your analysis on mobile users, you need to add one or two filters. Select User sessions from the navigation menu. Within the filter text field at the top of the page, type Application type: Mobile, as shown below. To more narrowly focus analysis on specific cohorts within your mobile user base, type in other relevant user-session attributes that are specific to the mobile users you want to analyze (for example, OS version: Android 2.3.3 or OS version: iOS 10.0.1. You might even type in a filter for a specific mobile-device manufacturer, as shown below. Another way of analyzing your mobile apps’ traffic is to focus on all the sessions of a specific user that were monitored during the selected time frame. Within a user-filtered session view, you can analyze each individual session of the user. Each session lists all users actions that were performed by the user during the analysis time frame (see example below for the user zara across a 2-hour analysis time frame). Without an Application type: Mobile filter and a Users: zara filter set on the preceding page, the results shown here would include all user sessions from all users originating from both Web applications and mobile apps. You can alternatively filter results for a specific mobile user by calling the API function identifyUser("zara") directly within your mobile application code. 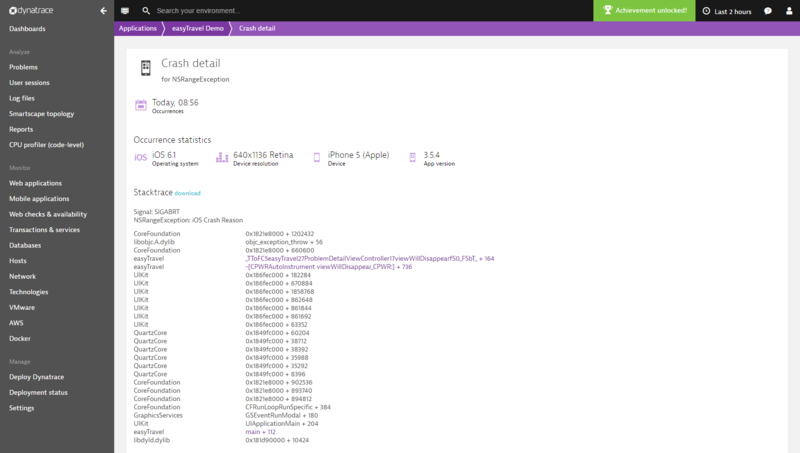 This API function call is available with the Dynatrace OneAgent for Android and iOS 7.x or higher). User session analysis provides the perfect omnichannel view of all user activity across all your web and mobile channels. By selecting one of Zara’s mobile sessions, you can view details of the session on a User session page (see example below). This view shows all user actions that were performed by the user zara during the selected session. Session details contain important device-related information such as device resolution, device manufacturer, device OS, geolocation, and user IP address. In cases when a user session ends in a crash, user session analysis shows you the complete sequence of user actions that preceded the crash. A provided link to the related crash report gives you access to all the necessary code-level information you need to quickly resolve the root cause of the crash. With the introduction of user session analysis for mobile users, Dynatrace mobile monitoring is now complete and available to all Dynatrace users. Dynatrace mobile monitoring is seamlessly integrated with Dynatrace real user monitoring and is offered at standard user session pricing.